The alarm rang, and I shut if off, intending to sleep just a little bit more. When I awoke again, I saw that I had just 10 minutes to get up, get dressed, and get to breakfast. For me, that is not possible. I rushed and got downstairs 25 minutes later, only 15 minutes after closing time. I was graciously accommodated without any question. Breakfast here was pretty good – choice of American (bacon and eggs), continental, or Asian, including toast and coffee, and a great bargain since it was included in the price of the room. Temple Quest continued for the second day,this time to the west and northwest part of the city. The traffic there was at least as intense as the rest of the city, and the sidewalks were equally treacherous, shifting from obstructed to narrow to uneven to non-existent, all within a few yards (well, maybe I should say “meters”). It’s also a photographer’s nightmare, trying to find the scenics and snaps and the right angles and lighting while simultaneously watching the sidewalk and trying to stay out of the traffic. I recognized one of the temples from the last trip. 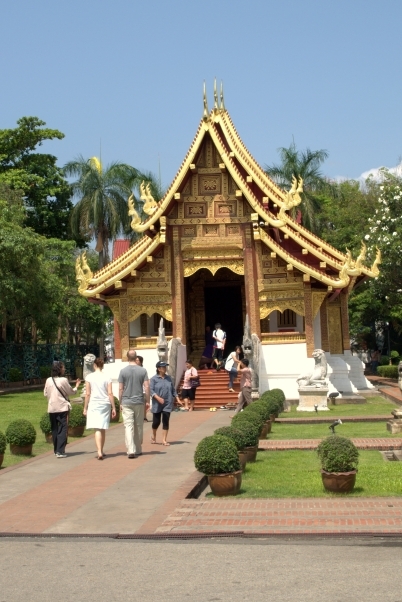 This time, I had the luxury of exploring the temple grounds in a more leisurely, independent way, sitting, enjoying the peace, watching some tourists, and just being there. 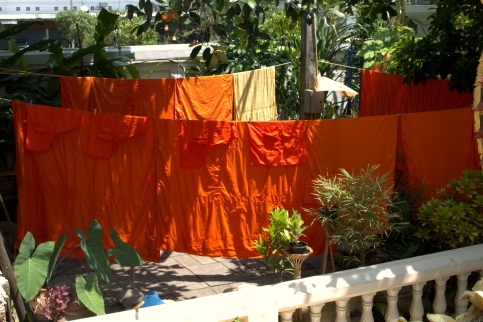 Stumbling across the monks’ laundry. 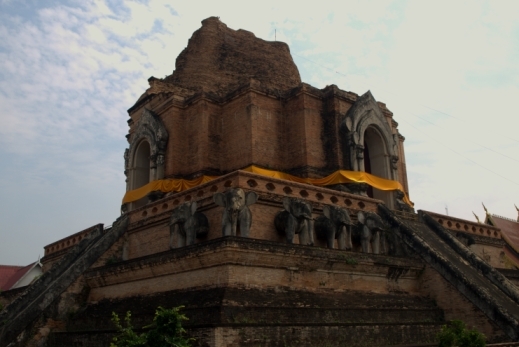 Thinking about what the Chedi might have been like before the earthquake reduced its height by half 300 years ago. Not quite the same as sitting in the quiet of Notre Dame, but not so different, either; there is a power in places like this that can speak to you if you listen quietly, with humility. Peaceful or not, after so many temples, I became hungry and footsore again. It was time to look for a place for lunch, and I soon found a sidewalk café, a small step up from a Singapore hawker stall, but the same system. There was a picture menu on the wall – names and prices were all in Thai, so I knew lunch was going to be pretty random. My basic choice was between rice and noodles. Each had sauce and meat options, but since all the pictures looked pretty much the same to me, any choice was a wild guess. Rice, since I had noodles for lunch yesterday. And then, um, this. Even after it was served, I wasn’t sure what I had. A plate of rice, with a savory brown sauce and small pieces of meat with crispy skin. Not chicken, so probably pork. It turned out to be a hearty dish, served with small bowl of soup, and a bottle of water on the side. Ice came in a separate cup, and I didn’t remember until it was too late that the ice would be made from municipal water which might have some unintended consequences. Lunch was accompanied by plenty of noise and exhaust from the traffic and cost a grand total of 45 Baht, or a little less than $2. When I questioned the amount – how could it be that cheap? – the waitress assured me that the price was correct and that I was not overcharged. (Well, at least I think that’s how the conversation went. Between the traffic and her accent, there was a little disconnect between my English and hers.) At that rate, it was completely appropriate for me to spoil the market by leaving another 35 Bhat tip. I wanted to make sure that my Buddha shopping was successful, and the time at the Night Market had just left me a little confused. I flagged a tuk-tuk and held on as we wove and dodged our way through traffic from one side of the city to the other, and back to yesteday’s shop: Lanna Antiques on Tha Phae Road. Chiang Mai is a city of one-way streets, so the driver had to go down one main street, cross over, and come back on another busy street to get to the shop. The cross street was a narrow market lane, lined on both sides with open-air stalls and filled with people, bicycles, motorcycles, tuk-tuks, and cars. Some were moving, some were parked. It was chaos, organized only by the principle that all motorized traffic was moving – when it was moving – in the same general direction. Clearance between any two objects in the street was just a few inches. Even the tuk-tuk driver had to look from one side to another to make sure he would clear. Progress was herky-jerky, but there were no collisions. Would it really be ok to try to take a Buddha onto the airplane with me? 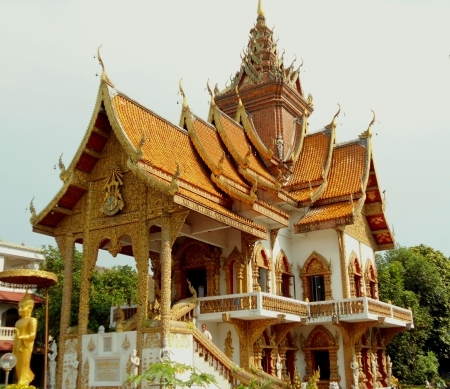 There are special rules for taking Buddha statues out of Thailand. It’s allowed, but difficult. An export permit is required from the national museum to guarantee that some part of the national heritage is not leaving. All statues, whether new or old, have to be accompanied by the certificate of inspection. There is a small glitch in the system: certificates are not issued for heads or hands or torsos or anything less than Buddha in some Buddha pose. If you buy a Buddha head, you’re kind of on your own: certificate is required – but not issued. The alternative – and it seems to be pretty well-known (“everybody does it, and they don’t have problems”) is to tuck the statue into your suitcase – not hand luggage – and don’t declare it. Since all suitcases, including those that are going to be checked, are run through the x-ray machine at the front door of the international terminal, that seemed like a risky plan and a bad idea. Even if ignorance might be an acceptable defense, the art would still be seized. Since I didn’t like any of the alternatives( forfeiting a statue, paying a fine, or spending time in a Thai jail), I asked the shop if they could ship. Yes, and when they looked up the price to Singapore, it wasn’t too bad. “Can I have your passport?” They need to make a copy to go with the request for a museum certificate. And that was how I ended up on a motorcycle, sitting behind a 20-year-old, weaving through the fog of afternoon traffic in Chiang Mai, Thailand. Love the imagines and especially the writing… I feel like I’m along with you on your adventures! And adventures they are! mIKE, WHAT EXQUISITE WRITING. THANKS FOR YOUR INCLUSION.